Successful organizations must master connectivity to colossal volumes and varieties of data sources located everywhere to remain relevant. Windows of opportunity close quickly. Agile connectivity is essential to thrive in the digital era. 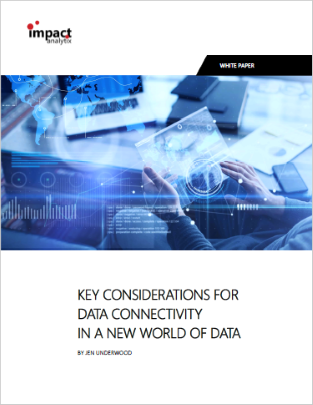 This paper from Impact Analytics founder, Jen Underwood discusses the current state of connectivity and shares key data connector selection criteria. Today's data landscape is a labyrinth of numerous diverse data source types and cloud Apps. Despite enduring security and data privacy concerns, companies continue marching to the cloud at a steady pace. As a result of this truly transformational trend, the center of data gravity has shifted. Connector strategies used by developers to unify and monetize data from a growing list of data sources will seal the fate of digital era software. Download the solution brief to learn more. FirstName is required, please enter it. Your email is required, please enter it.